Pinning apps to Start -- but which one? How would you fix Windows? The buzz of Microsoft’s leap to Windows 10 may be dimming, but the big, 640-million-user question remains: If you skipped Windows 8 because the initial two-face kludge left you cold, should you think about upgrading to Windows 10? Or has Microsoft gone down so weird a tiled rabbit hole that you should dig your heels into Win7 and kiss the new direction good-bye? I'm not talking about optimal interfaces for contortionist computers or oversize phones. I'm talking about getting real work done with a keyboard and a mouse. Is Windows 10 as goofy as its predecessor? Or does the Technical Preview suggest that Microsoft has righted enough of Win8’s wrongs to make it a worthwhile PC upgrade? All the predictable beta software caveats apply: We're working with the Windows 10 Technical Preview build 9860 (released Oct. 21), which will be quite different from the final, shipping version of Win10. But the plumbing is in, and there's enough meat to start thinking about your Windows future. You avoided Windows 8 because Microsoft took away the Start menu and replaced it with Metro tiles, right? Smart move. Win10 has a Start menu and tiles, but the emphasis is completely different. Here's a typical Win7 Start menu. On the left, at the top, menu items are pinned to the Start menu; below is a more-or-less-most-frequently-used list. The Search box is at the bottom. Click on the wedges to the right of the menu entries and you get a most-recently-used list, sometimes with a list of functions inside the program. Fixed links are on the right, pointing to common locations and programs. They can be modified, but only in a rigid way. At the bottom you'll find power options. Here's the Windows 10 Start menu, as it exists in build 9860 -- and it will certainly change before Win10 hits the stands. An experienced Win7 user will immediately identify the menu list on the left as a familiar standby, and no doubt realize that the Metro tiles on the right are vestiges of a long-forgotten civilization. If you don't like the tiles, right-click on each and choose Unpin, and they're gone. Aside from the cosmetic reworkings -- the power options are at the top, next to the name, for example -- the general layout of the left side should feel comfortable. What's not so obvious: Very significant changes lurk under that familiar face. All in all, though, Windows 10 looks to have somewhat righted the Start ship that Windows 8 attempted to sink in favor of Metro. In Win10, if you want to open your Documents folder, you pick the Documents icon on the left. Hovering over the Documents icon brings up a list of the most frequently visited folders. In Win7, if you want to open your Documents Library (there's a difference, which I'll discuss later), you pick the Documents menu item on the right. Navigation in Win10 is also different because choosing File Explorer lands you in Home, a made-up location new to Win10. More about that later, too. Is basic navigation better in Win7 or Win10? Hard to say. In practice, I found it easy to adapt to the new way, but folks who skipped Win8 might balk at the Metro tiles on the right -- until they delete 'em. Windows 7 users generally get accustomed to the fact that the All Programs list becomes unwieldy after a few years of work: New applications frequently stick a single entry on the All Programs list, and the result is an alphabetized list of programs that are hard to pick through. If you've ever seen an analogous field of Win8 Metro tiles, you're probably still looking for that one right tile. As the Technical Preview stands in build 9860, all of the Metro apps -- there are many -- appear as single entries in the All Programs (now All Apps) list. You'll have a lot more offal to wade through. Windows 7 users know they can pin a program to the top of the Start menu by right-clicking on the program in the All Programs list and choosing Pin to Start. In Win8, if you pin to Start, you get another tile on the Metro Start screen. Oy -- no wonder you skipped Win8. Pinning to Start in Win10 isn't much better than in Win8. In Win10, if you right-click on an All Apps program and choose Pin to Start, the program appears as a Metro tile on the right side of the Start menu. Experienced Win7 users will be frustrated/confused that the only way to pin programs to the left-side Start menu is to drag them from Start's left side most-recently-used list. You might have avoided Windows 8.1 because the search thing creeped you out. Guess what? It's still an issue in the Technical Preview build 9860. In Win10, using default settings, running a search on your PC sends the search string to Microsoft, where it can be used to, uh, enhance your shopping experience. 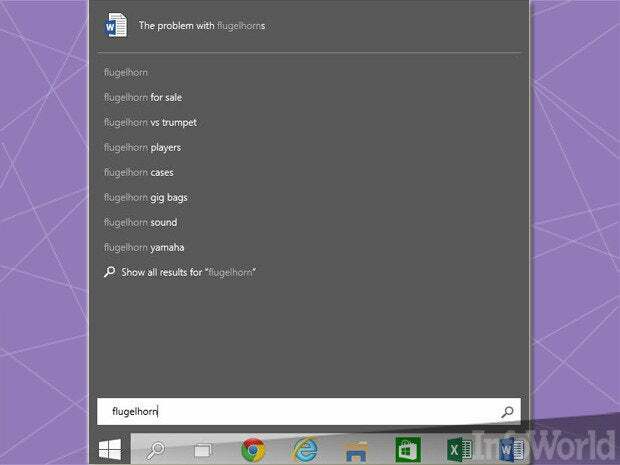 In this example on Win10, I searched for "flugelhorn" using the Start menu's search box. I got back a list of the one Word document on my machine that contains the word "flugelhorn" in its title, along with a full Bing search for "flugelhorn." Microsoft now knows that I searched my personal PC for the word "flugelhorn." Cue the ads. You may have avoided Win8 because you heard it didn't support Libraries. No relief there -- Win10 also makes it hard to find your Libraries. In Windows 7, when you start File Explorer, it opens by default to your list of Libraries, as you can see here. The extensive use of Libraries was one of Windows 7's key selling points. In Win8, you have to root around to even see them. While the concept of Libraries has many salubrious sides, Microsoft found that most people were confused by them. Thus, although Libraries still work in Windows 10 -- they'll come across intact if you do an in-place upgrade from Win7 -- they're buried in Win10, exactly as they were in Win8. In Windows 10, when you open File Explorer, you arrive at Home. The new Home isn't a physical location -- it's a made-up accumulation of locations that seem to add another layer of click-through obfuscation to an essentially simple concept. I don't get it. In Windows 8 you go to a made-up location called "This PC." I never got that, either. Microsoft may make it easier to set a real location for starting Explorer, but for now it's a mess, no better than Win8. It could be worse. 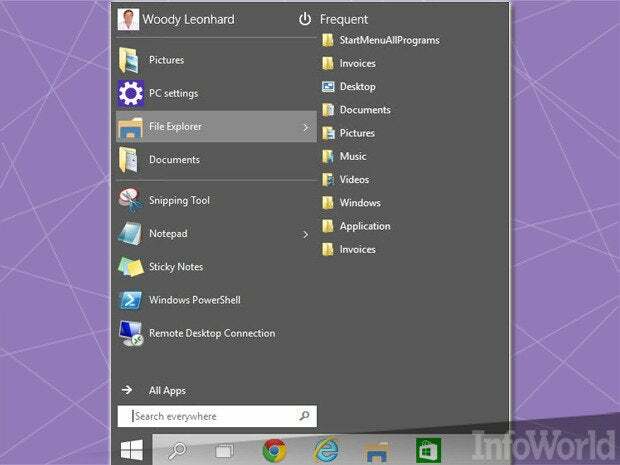 Explorer could open to OneDrive. Did you skip Windows 8 because it doesn't support gadgets? I use gadgets in Win7 all the time. Microsoft touted them as one of the great new benefits in Windows Vista, then killed them in October 2011, when security leaks got to be too much. Gadgets are back in Win10, for all intents and purposes, but they work a little differently, and they have a new name: They're Metro tiles. Win8-style Metro tiles, resized and sitting on the desktop, run rings around Win7 gadgets. In Win8 you couldn't put them on the desktop. In Win10, you can -- although there are still problems making tiles as small as gadgets. Who could forget the Windows 7 Control Panel? With its kludge-inspired interface and thousands of settings tucked away in obscure corners, the Control Panel has forced millions of Windows 7 customers to waste tens of millions of hours trying to find their way into the settings of the beast. Thank heaven for the Search box in the upper-right corner. If you skipped Win8, you missed a very-half-fast attempt at moving the Control Panel over to the Metro side of the fence. In Win10, the effort still isn't complete, but it's much better than in Win8. On the new Start menu, click the Start button, then PC Settings. You see something like this slide -- and it's sitting on your desktop. The old Control Panel is there, but it's harder to find. (Hint: Right-click on the Start button.) The new PC Settings app has quite a few settings not included in the old Control Panel. Conversely, the old Control Panel has many settings that aren't yet in the new app. Kick around the Windows 10 PC Settings app for a bit, without looking at the Win7 Control Panel, and try to come up with a list of worthwhile tasks you can do in the old, but can't in the new. I bet you'll be hard-pressed to find even a few. One of the worst design decisions in Windows 8 was the deprecation -- actually, the complete evisceration -- of Win7's Previous Versions capability, replaced by the much-maligned Win8 File History, which adds a hard-to-navigate front end to a very simple concept. If you skipped Win8 because it didn't have a usable alternative to Previous Versions, you may be in luck. At least in the Windows 10 Technical Preview build 9860, the Previous Versions tab in Windows Explorer is back. I'm having a bit of trouble getting it to work like the Win7 Previous Versions, but hope (hope!) that's merely beta blues. While it's still much too early to say that Win8 holdouts should jump from Win7 to Win10, I would say that the Technical Preview holds out a lot of hope that we Win7 diehards will have a decent upgrade path. Microsoft's listening. That's a 180-degree change from the Windows 8 mantra of "eat our dog food and like it." 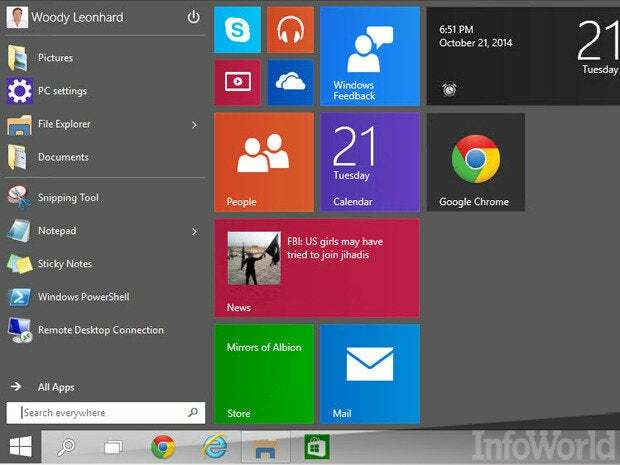 There's a group already hard at work bringing the distinctive Aero Glass interface to Win10. We're seeing serious attempts at making Windows 10 desktop gadgets -- even if they're disguised as Metro apps in the Windows Store. We’ve already weighed in on where we think Microsoft should steer its flagship, with Windows Red. If you have gripes or suggestions, leave them in the comments, and I'll make sure Microsoft hears about them.